For some reason the days in San Diego keep getting hotter and hotter as days go by. We all think what could be the best outfit to wear without getting all sweaty, makeup dirty, and hair all messy… I have been recently wearing a lot of dresses since my last trip to Italy, I find them so easy to wear and accessorize as well, I dont know about you guys but I have this tendency to wear either short jeans for a while or dresses and rompers; this past weeks have been all about the dresses as you can tell. This dress I got it last week and wore it the next day, I decided to wear it with my super comfy shoes and my favorite bag of the season. Believe it or not I love wearing sneakers but at the same time with dresses it just makes the complete outfit a little less formal and a little more casual… I am more of a causal gal as you see on my IG so sneakers are always on my mind. 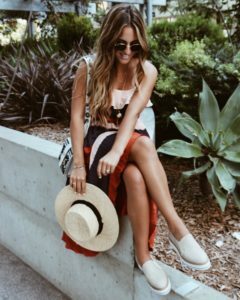 I love how dresses look with sneakers! Very cute!